UU A Way Of Life: How will we deal with climate change: like sheep or mature men and women? How will we deal with climate change: like sheep or mature men and women? This analogy of sheep to human beings seems keenly appropriate especially as it comes to the insanity that is contributing to climate change. Human beings are contributing to it and as the old line from the comic strip Pogo said, "We have met the enemy and he is us." Except climate change isn't about us vs. them, but will affect all of us rich and poor alike. Of course, the rich can insulate themselves longer by capturing resources to mitigate the negative consequences while the poor will be the first to suffer and die, but eventually, homo sapiens along with many other species of animal and plant will become extinct. There will be a lot of head butting as the competition for land, food, and other goods increases because of the influences of our changing climate. There is no God to save us, and Mother Nature operates on the principle of Karma not benevolence. And so, like Dellarobia watching the newly shorn sheep, we are left to wonder how our climate changing will play out when the new pecking order gets established and new roles are developed for people to play leading us to be able to recognize the cast of characters one from another. Unlike sheep though we are conscious creatures who can influence to some extent our own fate and whether this new fate will be founded on love, compassion, and justice or on attack, jealousy, and oppression remains to be seen. It is in our hearts and hands as Unitarian Universalists to show the world that there is a better way. A grim picture is painted here and I think you may be an alarmist until I think of Hurricane Sandy and what it did to New York City, and the droughts in California and the Southwest. Hopefully we will help one another and not hunker down into a survivalist mentality. Resources though will have to be reallocated and how this will happen in a radically capitalistic, materialistic society is questionable unless our values change significantly in the near future meaning the next 5 - 10 years. Thanks for the thoughtful essays on Flight Behavior. I am enjoying and learning a lot from the book. 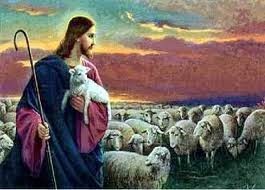 The idea that God who is looking down on His sheep and who is the "good shepherd" are avoiding responsibility for what is facing us. A "deus ex machina" is not going to occur to bail us out of our current and impending predicament. Our religions are not going to save us nor our gods, it will be changes that we have to make ourselves. Are we up for it?